This is one monster of a fighting vehicle and the biggest, heaviest one we’ve ever produced. The M26 entered service in 1943 and was used extensively and virtually exclusively by U.S. Armoured Forces in the latter part of the war. This same armoured tractor vehicle was also utilized (with a massive trailer attached) as a tank transporter. 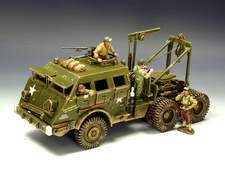 The K&C Recovery version is meant to be used on battlefield displays to haul out both German and American war-damaged armour and even heavy artillery and other larger vehicles. Four full-bodied crewmen service the vehicle and it comes with rolling wheels, a weathered paint finish and the legend “You break’em… We take ‘em!” painted on the side. Measuring in at 4 1/4” x 11” and weighing a hefty 4.7 lbs this M26 is a “must” for any serious collector of K&C WW2 fighting vehicles and figures. Just 1250 of this particular “monster” will be available in its own specially designed packaging.